Home » NEWS » NO MORE HIGH FEES, NO MORE AGENCY, NO MORE BROKER? STAY REQUIREMENTS FOR MIGRANT PASSES? MUST READ!!! NO MORE HIGH FEES, NO MORE AGENCY, NO MORE BROKER? STAY REQUIREMENTS FOR MIGRANT PASSES? MUST READ!!! Many of us wanted to work abroad because it can give us much more benefits, compare to our homeland especially when it comes to salary and other bonuses aside from their money currency is much higher. we just wanted to work abroad because we wanted to give a better life to our family, we wanted to give the best to them when it comes to food, health, clothes and most of all in when it comes to education so after they graduate they can find better job to support their own family in the future. Another reason why working abroad is a great option is you get to experience a different culture. When you accept a job overseas you are fully immersed in that culture and lifestyle. You get to experience new foods, new languages and meet new people. If the country you are working in doesn't speak English, you have the opportunity to learn and become fluent in a different language. Most people who are learning a different language find that when they fully immerse themselves in that culture it is easier to learn. When it comes to salary we can be able to provide much more to our family, we can be able to give much more when it comes to food, shelter, health , and even in education. we wanted to give our very best to them so they can live comfortably, however, their's a lot of sacrifices you must go through. Taipei, Oct. 21 (CNA) Migrant workers in Taiwan can be re-hired without having to leave the country every three years, according to an amendment to the Employment Service Act that cleared the Legislative Yuan Friday. the Legislative Yuan passed Friday the third reading of an amendment to the Employment Service Act, canceling the requirement for migrant workers to exit Taiwan after working for three years. Some 14,000 migrant workers will benefit from the new law, according to statistics from the Ministry of Labor. Under the current law, migrant workers are required to exit the island every three years, with those receiving professional training and demonstrating “exemplary service” permitted for an extension of up to 14 years. 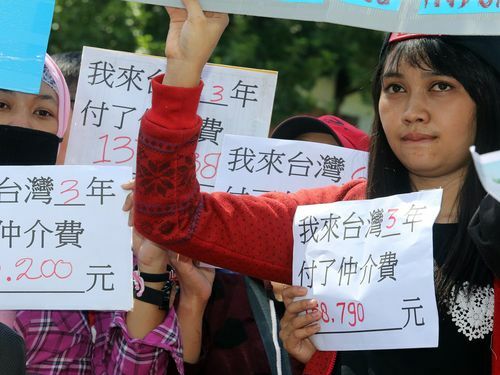 This requirement has placed a heavy burden on migrant workers, since it meant that they needed to pay brokerage fees each time they re-enter Taiwan, entailing a personal cost of NT$80,000 to NT$150,000 every three years. In most of those cases, migrant workers need to pay brokerage or regulation fees to re-enter and work in Taiwan again, fees that can pose a serious financial burden, the ministry said. In her draft bill, DPP legislator Wu Yu-chin pointed out that these restrictions were meant to deter migrant workers from overstaying their visas in a bid for permanent residency. However, as the Immigration Act has been amended to preclude foreign workers under the Employment Service Act from obtaining permanent residency, the exit requirements have thus become unnecessary. It will take effect as soon as it is publicly posted by the Presidential Office, a formality that usually takes fewer than three weeks. While the amendment was welcomed by migrant workers, employment brokers and some employers expressed their opposition. Huang Gao-jie CEO of the Taoyuan City Employment Service Business Association said the requirement that migrant workers must leave the country after three years was designed to eliminate inferior workers. This Amendment is good for every migrant worker here in Taiwan, I salute to the government of Taiwan who really never failed to amazed the migrant workers in all aspect so they can live comfortably while working here in Taiwan.